Opening The Friday After Thanksgiving! Daily, 9 am to 6 pm. Come and take your pick from a variety of shapes and sizes, that are freshly cut throughout the season! Taking Orders Now For Your Christmas Decorations! Any of the wreaths can be custom arranged, with or without decorations. 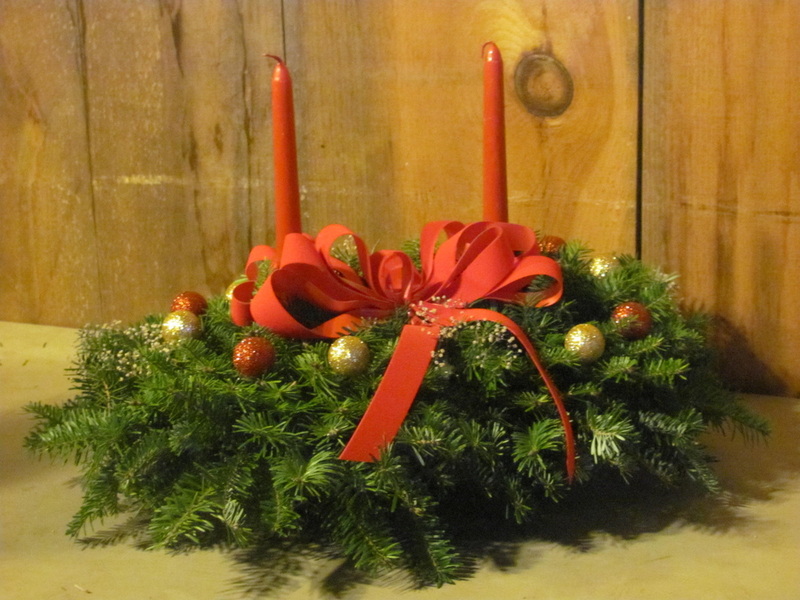 They range in size from a 12" ring size (looks great on your front door!) to 48" (stands out on a barn or outdoor building, spreading the Christmas spirit to passers by!). With a 22" diameter and a variety of ribbon colors available (Red, Brick, Burgundy, Blue, and Plaid), our Christmas balls are beautiful hanging from your porch! Centered on your dining room or coffee table, our centerpieces are available in a variety of candle and ribbon colors (from a traditional Christmas look to a victorian or winter touch) and they even give off a wonderful aroma to fill your house!